When most Floridians hear that word, they think of a covered area at a public park with picnic tables. But when designing your ideal outdoor living space, if you love the outdoors and would enjoy a covered area detached from your home, a back yard pavilion could be the perfect option. A pavilion offers many of the same benefits of a covered patio or deck area, like seating with protection from the sun and rain. With the additional benefit of being separated from your house, offering more seclusion. A pavilion can be built in the middle of a garden or the opposite side of the house from the pool. What do you enjoying in the tranquility of the outdoors? Gardening? We can build a customized garden center in your pavilion. Watching your favorite sports team? We can put a TV and your favorite seating in your pavilion. Painting? We'll create an art studio in your pavilion. Writing? We can put the desk, table or seating that inspires you to write in your pavilion. Relaxing? How about a hammock or outdoor sofa? 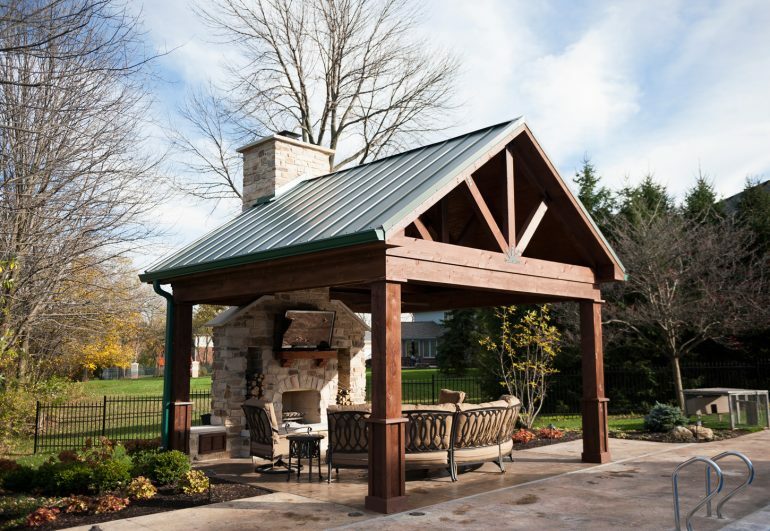 We can put pretty much anything you want in a pavilion to create the the outdoor oasis you've always dreamed of.